1955. 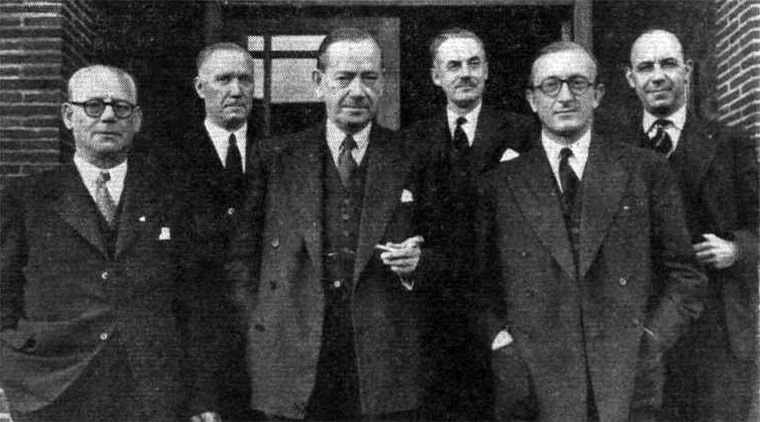 Reginald Virgo Atkinson at far left. (Image: FLIGHT). Reginald Virgo Atkinson (1894-1979), Director and Works Manager of Gloster Aircraft Co.
1894 December 12th. Born in Leeds. His son, Anthony James Atkinson, was killed on February 15th 1945 in Harare, Zimbabwe, where he was an RAF Pupil Pilot Training Officer. Reginald Virgo Atkinson was awarded an OBE in the 1955 Queens Birthday Honours for his work at the Gloster Aircraft Co.
1979 11th June. Died in Leckhampton, Gloucestershire. ↑ S. George (family research). This page was last edited on 15 January 2018, at 11:16.